A couple of years ago, all of the teachers in our junior division (grades 4-6) had an opportunity to get together during the instructional day to focus on student achievement and improvement, and we spent part of our time discussing some of the lazy mistakes our students were making in their work. We decided that we needed a divisional focus - a plan, something our students would see year after year and would begin to understand was an important part of their work regardless of whose class they were in. The Big 5 No-Excuse Error list was born! In fifth grade, these are some of the basics that can be expected from all of my students. (The homophones were added afterward. As we focused on them in other lessons, we added them to our No-Excuse list.) 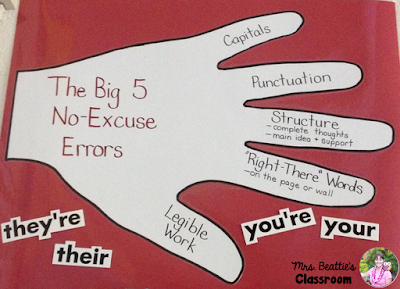 I can now refer to these "No-Excuse" issues in my students' daily work. What strategies to do use in your classroom for these types of "lazy" errors? I love that your division has take a group approach, I think consistency in expectations is key. You are right it is great to have a clear expectation to quickly reference when helping students edit their work. It makes such a difference when there is consistency! !